The records, released by the Pima County sheriff's department, include transcribed interviews with witnesses and various police reports, and provide new insight into how the shooting occurred. PHOENIX — Authorities investigating the shooting rampage that killed six people and wounded Rep. Gabrielle Giffords and 11 others compiled nearly 3,000 pages of documents released Wednesday that provide a fresh glimpse into the 2011 attack, including the erratic behavior of the gunman, a tense interrogation and the chaos that enveloped the bloody scene. Jared Lee Loughner was polite and cooperative but complained of feeling sore as authorities began their hour-long initial interview of the gunman. The conversation as Loughner sat in restraints in an interview room was mainly small talk. Little was said over the first four hours. Loughner asked if he could use the restroom, then at one point complained he felt sore. “I’m about ready to fall over,” he said. The roughly 2,700 pages of documents on the shooting outside a Safeway where Giffords was hosting a meet-and-greet with constituents have been kept private since the January 2011 attack. The records, released by the Pima County sheriff’s department, include transcribed interviews with witnesses and various police reports, and provide new insight into how the shooting occurred. “The next thing I hear is someone yell, ‘Gun,'” said Hernandez, who rushed to tend to Giffords’ gunshot wound to the head. News organizations seeking the records were repeatedly denied the documents in the months after the shooting and the arrest of Loughner, 24, who was sentenced in November to seven consecutive life sentences, plus 140 years, after he pleaded guilty to 19 federal charges. U.S. District Judge Larry Burns had prevented the sheriff’s department from releasing the records in response to a request from The Washington Post, ruling in March 2011 that Loughner’s right to a fair trial outweighed whatever disclosures might be authorized under state law. Last month, Burns cleared the way for the release of the records after Star Publishing Company, which publishes the Arizona Daily Star in Tucson, had sought their release. The judge said Loughner’s fair-trial rights are no longer on the line now that his criminal case has resolved. Loughner’s guilty plea enabled him to avoid the death sentence. He is serving his sentence at a federal prison medical facility in Springfield, Mo., where he was diagnosed with schizophrenia and forcibly given psychotropic drug treatments. Arizona’s chief federal judge and a 9-year-old girl were among those killed in the rampage. 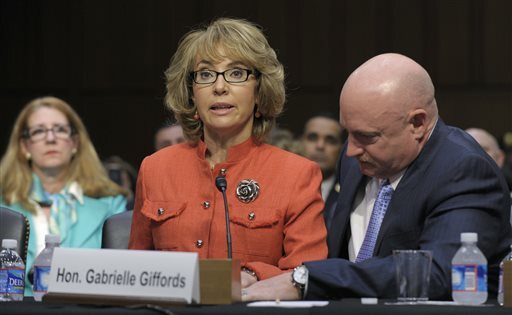 Giffords was left partially blind, with a paralyzed right arm and brain injury. She resigned from Congress last year and has since started, along with her husband, a gun control advocacy group. The Star said it wanted the records because they contain information about how a mass shooting occurs, including how long it took Loughner to fire gunshots — an issue raised by some advocates in the debate over high-capacity pistol magazines. The Tucson newspaper argued that the records are critical in the national debate over whether such shootings could be prevented by armed resistance, whether a mass shooting occurs too quickly to be stopped and whether people with mental illnesses should be prohibited from getting guns. Phoenix Newspapers Inc., which publishes The Arizona Republic, and KPNX-TV had joined Star Publishing in the latest effort to get the records released.